WE ARE SUPPORTED WITH GOODS MADE BY OVER FIFTY HUMANS. TO BETTER UNDERSTAND WHO THEY ARE, WE’RE SPOTLIGHTING ONE ARTIST MONTHLY. AS 98% OF OUR MAKERS ARE WOMEN, WE’RE SHINING A LIGHT ON WHAT’S MADE HER, THE MAKER. Found’s Make(Her) Series No.3 spotlight lands on Tanya Hughes (TH) —Alchemist and Plant Devotee— interviewed by Found Natural Goods Founder, Jacqueline Smith (JS) to simply get to know what has lead Tanya to building her passion and business, Amulette Studios. A theme of seizing opportunities, staying true to her desire and intrinsic nature to create, and a call to be of service seems to be the reoccurring fire beneath all that she’s done and continues to do. The two met up in mid-March 2019 and had some healthy Mother’s Café takeout at Tanya’s studio beginning this interview halfway into their lunch. Tanya and Jacq have had the good fortune to be at several pop-up markets together over the past three years, have collaborated on client work together and now in the realm of Found with Amulette Studios’ nearly full line being offered at the shop while Tanya so generously offers chance Self-Care Sunday pop-ups where she mixes custom sprays and oils for lucky Found patrons intrigued in her plant magic. JS: [laughs] I knew I’d get pushback from you! TH: [laughs] Well, I like it. But I’m not sure what it means, you, know? I’m not formulating the plants—they’re already formed. Plant Devotee, maybe? I think it’s something about how the plants are already doing their thing. How about Plant Interpreter? ‘Cause I’m just picking up the vibe and putting them together which is the alchemy part, right? JS: What is your earliest memory of plants or your art form coming into your world? TH: I definitely sought refuge as a child in nature. I had a really challenging childhood and so, nature was the place that I would run to —literally— and it was the place that I felt safe. Where I felt connected to something bigger than myself. Even as a child, I would have never languaged it that way, but looking back that’s what it was. I constantly had my feet in the earth, my hands in the earth, climbing trees —wild in a lot of ways— I’m surprised that I got away with what I got away with, you know? Hours at a time of being gone and just lost in the woods. And so I think that was really what my foundation as a young person and I never left it. I always knew moving into adulthood it was very important for who I was to maintain a very deep and very real connection with my environment, my surroundings. At that time it wasn’t a conscious decision to work with plants, it was more a feeling. I think nature is, it is just so wild and there is so much we don’t know about. I feel like one of the things I receive from nature, especially as a child, is an increase in my imagination. I think a lot of my artistic lean really came from that wild-ness, from these things that felt sort-of unexplainable, mystical or unknowable and yet completely tangible, it all just helped to breed more imagination within me, more curiosity. I don’t really know how to language it other than that because we’re talking about such a felt sense and certainly non-linear experience. But, I knew, very early on, that I wanted to create a life that was ultimately about being a creative person. In my world as a young person, everyone around me was very much in readily identifiable professions and everyone was miserable. There were no adults in my life that I remember as being super psyched about their work and what they were doing. They were making decent money and they would go fulfill their obligations, but as soon as they got home they would just be like, “Thank God I’m not doing that.” And I thought, “No way. Why would I choose to do that?” So that was part of my impetus to choosing more of a creative path in life in terms of my focus and also as a profession. JS: What is our setting here? TH: I grew up in the suburbs of Seattle called Lake Forest Park and this was early to mid-’70s. So there’s a lot of these properties where you’d have one, two, and three acres that were outside the city limits that you’d have all this space because it wasn’t developed yet. It’s not like that anymore, but back then it was really wild and overgrown with Douglas Fir, Cedar Trees, Salal, mosses, ferns, classic PNW native plants. JS: Did you have siblings? TH: One sister. Two years older. JS: Was it a big family or a pack of wild neighborhood kids? TH: No, unfortunately, it wasn’t! Again it was more like suburban rural, so I wouldn’t say we were out in the country, but we had this undeveloped green space. Nobody owned it, but it was like we had an extra four acres. TH: [laughs] Right, yes. But we weren’t supposed to be playing on. But we did it anyway, right? It was really just me and my sister and she was very much a classic artist —where I was more physical and was all about movement and being in my body in nature— she would sit and draw for hours and hours. So we didn’t play together a lot, I would spend time alone, just out in the woods. JS: Did you ever make potions when you were little? TH: My potions consisted of mud puddles with little twigs, ferns, and huckleberries and anything I would find. I literally would create a hole in the ground and add a little water and stir it around, and some fir needles and some moss and I didn’t even know what I was doing it for. JS: Was it for your dad as a gift or to eat? TH: No I was more just fascinated by the alchemy of it. And again I wouldn’t use that word as a kid but I was fascinated by mixing things. That’s so funny I’ve never thought about that. I’m so glad you asked that question. But I just remember the idea of consistency and texture, viscosity, and color. It was more of a tactile, sculptural thing. I would rub it all over my hands. That’s so funny! [laughs] I’ve never thought about that. JS: You were a little bit more of a tomboy? TH: Definitely. Always. I think it was really my dad. My dad was our primary care provider, and even though he had a city white-collar/blue-collar job at the same time, he loved nature. His time after work was definitely about being outside. TH: No, it was more him doing his own thing—but I modeled it. Like he would chop wood and so I’d want to chop wood. Very dude-like things. JS: [laughs] Oh, girl. I get it. TH: [laughs] Yeah! And we’d spend a lot of time up in the San Juan Islands too because he loved sailing. We had this great, classic west side of the cascades experience nature-wise. We’d sail to all these different islands, and as a kid again we could just run free because it was an island and nothing was going to happen to you, you weren’t going to get lost or hit by car. We would moor offshore and me and my sister would just run free and we wouldn’t see anyone other than a deer or two until dinner time. We had a good balance of salt and earth as a kid. JS: When did you learn there was a job as a Herbalist or that you could work with plants? TH: You know that was a way out because I went into photography and filmmaking in my twenties. I think that observer-mind from spending time alone in nature got channeled into photography —I was pretty painfully shy, so observation was already a habit— so why not put a lens in front of my eyeball and do the same thing? I spent my twenties doing that. And then as the jobs got bigger, the money got bigger and the egos got bigger - I really got burnt out by it. So I choose to leave the profession, and the industry, and then I got into massage therapy. Tanya mixing up a custom “everything spray” at Found during a Self-Care Sunday Pop-Up in September 2018. JS: That is such a leap! TH: I know. It was such a wildcard experience. A friend of mine was considering naturopathic school/massage school, and he wanted to go take a weekend “how to give a massage workshop.” He really wanted me to go with and support him. All I was thinking about was how I’d have to touch people I didn’t know. I’d never had a massage in my life, I was in my late twenties, very punk rock and again in film and music industry —still in Seattle— I end up going reluctantly and I loved it. The school was so intelligent, they talked all about the anatomy and physiology in a very available way to a pedestrian like me and everyone else in the room. Even the psychology of touch. It wasn’t at all the scheezy thing I thought it was going to be. It was really legit. And it made so much sense to me. When we actually started doing the practice —me being such a tactile person— I was like, oh I know this, it was like I’d done it before. It just unlocked a piece of my brain where it made sense. It felt like sculpture to me—like a tactile art. JS: Oh, so maybe it wasn’t such a big jump to go from one form of art to another? TH: [laughs] Hahaha, yeah exactly! Yeah, it wasn’t separate to me. Because, outside of the commercial work, a lot of the work that I did in film was documentary work which is about people. So it was constantly about trying to figure out what the important story was and how to give voice to it. And, massage is a similar thing. So what’s the story that’s going on with your body and how can we get to it, and try and address it so you can feel better. So similar conceptually but just a different approach. It was perfect timing really because I wanted to get out of the film industry. My friend ended up not doing the program. He was just the deliverer of a different chapter of my life. Not long after starting my massage career is when I started studying formally with a local herbalist who offered local wildcrafting and local medicine making apprenticeships before I moved down to Miami. JS: So there’s not necessarily a moment when you knew what you wanted to do? TH: No there’s never been a definitive ah-ha moment, it has always been just more about what intrigues me and makes sense. JS: What was the job in Miami? TH: I got this crazy job offer to help open up the spa program at The Standard in Miami. That’s what officially moved the film world away. The project was so demanding that I didn’t have any time left for film. Another friend of mine offered me the connection since I had this dual skill set of producing, managing budgets, and people plus massage. And it was so crazy. It was the furthest you could get from Seattle in the continental United States. And I loved it. I loved all the cultures that were there. It’s not just South America, or Central America, or Cuba, there’s a huge European population there, a huge Russian population there as well. It’s known as the fifth borough of New York. And then the tropical weather, and the sun, and the amazing ocean. It was the hardest gigs I’ve ever had though. Sixty hours a week, five days a week for four years—I think it literally took ten years off my life. Total trial by fire. I don’t think I’ll ever do something like that again unless it’s my own project. JS: You didn’t stay in Miami. TH: No, it wasn’t a sustainable lifestyle. It takes a lot of money to live there well. And it was just time. I had a good six-year stint. Then I had to figure out who I was again. I didn’t plan on spending that amount of time there, it just happened. I just kept saying yes. Because it was interesting! That’s who I am! If I haven’t tried something, most of the time I’ll say yeah ok I’ll try that. Why not? It’s a life experience. But I think the shadow side of that —I’m more discerning now— is that it can derail you from your specific focus. JS: But it takes bravery to say yes. TH: I think so. But at that point I was so invested, there was no plan B but I knew it was over. I ended up deciding on Salt Lake City, Utah to study with a couple of spiritual teachers that I had worked with throughout the years. When I was trying to decide what was next for me, I just felt like I needed to be a student again and to fill my cup. And so these two teachers I’d met years ago both happened to live in Salt Lake. All I knew is that I needed to receive. They both said the same thing, come, but let go of any expectations. I set up my life, a really quiet life where I’d hike in the hills almost every day. Take trips down to Zion and Moab, a pretty monastic life—total opposite experience from Miami. Almost a detox from the noise of it all. And then I studied with both of these teachers for about six months and it became clear that you can’t really do very deep spiritual work if you’re trying to work two spiritual paths at the same time. You have to choose one. JS: Who were your teachers? TH: One was a Zen teacher, Diane Musho Hamilton, and the other was a Hermetic Alchemy teacher, Sylvia Bennett. It became clear that I needed to choose one, and have that be my primary teacher. Just getting re-centered. So for me, it was about doing healing work. TH: But, after a few years I returned back to Seattle to help with some family challenges. Set up my private bodywork & breathwork practice. And when everything settled with my family, it was time once again for me to figure out where next. And I was doing design and consulting work at the time, so I could kind-of be anywhere as long as I had an internet connection. So I sold all my stuff, got the Element so I could camp out of it, and then spent a year driving around the United States—stopping to see people along the way. I was just about to settle into New Mexico and found out that my Dad was sick. So back to Washington I came. That time period was so weird because I just kept getting called back to the Pacific Northwest, even though I kept trying to get further away from it because I love the sun so much. I settled in Bellingham, set up my practice again. My Dad passed and moved to Bend shortly after and attempted to launch a private practice. I thought it would be much easier that it proved to be. I’ve lived in so many places and have pretty easily set up shop, but in Bend it wasn’t working. I kept thinking, oh my God, I think I have to reinvent myself. That’s where Amulette really came out of, that place where I had to ask myself Who am I now? What’s the next version of myself? What do I have to offer? JS: How did you know to ask that question? TH: I’ve done enough work to know when something feels like you’re trying to swim upstream, it’s just not working, your forcing it. It’s time to reassess. JS: So why not go bag groceries or get a job at a spa? TH: Oh, I see what you’re saying. I think because I’ve worked for myself for so long, it’s just not in my lingo to even do that. And it’s not because I’m above it, it’s just that I don’t know any different. I’m a creator, and it’s part of my wisdom and life experience and what I’m figuring out while I’m in this body and on this planet—what can I create? What is possible? JS: You’d said that when you were a little girl in the woods that you decided you were going to have a creative life. TH: Yeah so Amulette came from that question of what do I create next. Also wanting to be of service still. Wanting to not just scrap everything I’d learned. You know, what’s the next thread in me? I use that phrase at nauseaum. Where is it leading me next? And that just felt like the next step. Even with the spa consulting work, I’d created custom back bars before, I’d made body care products, I’d done topical work, I’ve made my own remedies both for in and out––so I wondered if it could work? As you know, it started at your first marketplace (INTO the WOODS Holiday Market). TH: Yeah that was the heat that I needed. Then I didn’t even know what I would do with it. I didn’t know that I’d make it a full-on business business. I said let’s just see if people like this and do this one market and see what happens. And then I saw that people liked it, and started treating it more like a true business. JS: What’s behind the name? TH: Amulette. Of course, the spelling is my own creation— I call it the feminine version of A-M-U-L-E-T —that’s the traditional spelling of an amulet, something that you wear. It means protection to the wearer. So I feel like, with all the topicals, that’s the intention behind it. It’s something that’s offering you protection, shelter, it’s offering you healing. TH: Thank you. And I liked that word studios because I am a creative person and you never know where this is going to go. TH: Don’t box myself in, you never know what’s going to happen next. JS: What would your advice be for your younger self? TH: Don’t worry so much, it’s all going to turn out fine. Enjoy the ride. It seems so cliché, but all you have to do is keep trusting and moving forward. JS: So now you’re in the pretty isolated, small, desert town. JS: What challenges does it bring a small business getting off the ground? TH: I feel like for me it was easier to get a small business off the ground here and I think for me it’s because I didn’t have as much distraction here––personally because there are maybe fewer things I’m interested in doing per say other than being outside that I could just focus on creating the things. And I feel like the nature of a small community is that I’ve met some amazing people that have been wildly supportive in terms of their dollars, feedback, and emotional support. Even more than when I was creating in Seattle, and we had a pretty awesome set of collaborators. But it still would be so hard to get stuff done because you would be spread so thin. The nature of this place for me was a great crucible. It’s the nature of your business though, right? My overhead was a lot smaller than other businesses may have in front of them. JS: What’s in the future for Amulette? TH: I really want to cultivate my one-to-one experience. So that’s something I’ve really been promoting––the custom work, and really trying to reach out to people to let them know they can ask me questions and that I’d like to help people partner what product would be best for them and why. That’s the healer-bodywork archetype in me that wants to connect in that way. I’m also really into infusing oils and potentially getting away from so much lean on essential oils. Because it takes so much plant material to create an essential oil. A cornerstone of my being is to do less harm, is to kind of live very lightly on the planet while I’m here. So I can’t not look at that. The essential oil companies as an industry, they’re really taking a lot more than they’re offering. Even though I’m a very small, small, small, small part of that—I still am conscious that I’m apart of that. JS: Visually it sounds gorgeous. TH: You won’t see plants actually in the oils. I won’t do it that way since most people have their oils for more than four to six weeks, and they begin to break down after that. Even though it looks great at first, with mine you’ll see the color implication of whatever the plant was. So if it was comfrey, it’ll super green or calendula, it will be orange. That sort of thing. JS: That’s smart. Ok, last call for why we’re here today. TH: [thoughtful pause] I guess my big plug in why I’m interested in offering Amulette is because I’m interested in offering people the chance to slow down and remember why we’re here and what it is that they want to create. And that’s a big ask but why not? There’s so many of us that are just operating day to day as a reaction and on autopilot. But I honestly believe that we are here to do more, and to experience more than the vocation, than the house you want to build or the house you want to buy, than the trip you want to take. This is such a crazy experience. Wake up to it. Wake up to yourself. Wake up to whatever it is that really makes your heart beat. And I believe that plants and aromatics have the capacity to help open those inner doors. They can help us connect and they really can help rewire consciousness with intent. You can smell something and think about the thing you want to create or let go of and it will help create a new structure within your brain. I guess with Amulette, that’s the not-so-secret underlying piece that I would like for people to feel like it’s a resource —that if they feel attracted— they can use to become more awake to their own being, to their own magic, to what it is they’re doing here––and why they’re here. 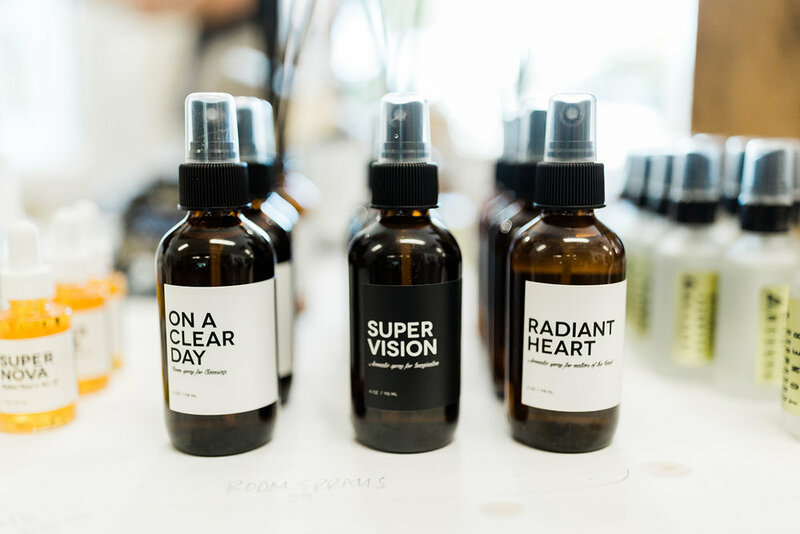 Amulette Studios organic body care products (with the exception of select oils only offered directly) are available inside Found Natural Goods’ new brick-and-mortar downtown Bend, Oregon on Brooks Street. For all those in Central Oregon who order from her site directly, you can save on shipping and materials with a local pick-up option at Found, or do even more by ordering refills to save on glass bottles, lids and labels—get all the details at AmuletteStudios.com.